A contractor has been appointed to construct IDA Ireland’s new Advance Technology Building (ATB) in Tralee, Co.Kerry. 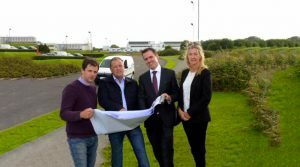 Contracts were signed in recent days allowing Eamon Costello (Kerry) Ltd. to proceed to construct the c.2,322m 2 building on a c.1.0 hectare site at Kerry Technology Park (KTP). IDA has agreed terms with Shannon Commercial Properties for the acquisition of the site. Building work will commence shortly and the building is expected to be constructed in nine months. The site was chosen as a suitable location for the Advance Technology Building given its proximity to the Institute of Technology, Tralee and the existing companies based in the Park. The building will include c854m 2 ancillary office space over two floors and c.1,468m 2 of high-tech manufacturing space – in line with the current needs of FDI client companies. The facility has been designed to be capable of 100% expansion to meet future client growth requirements. It has also been designed to achieve LEED CS accreditation in line with IDA’s sustainability focus.